This document is supplemented by a second document (C6) which gives further details on the two main forms of participatory management : management committees and users associations. A third document (C7) gives examples of successful achievements. Village water programmes mainly date back to the early 70s. Through investments from the states, they made it possible to develop the set-up of facilities such as wells and boreholes equipped with hand-pumps or motorised pumps, fire hydrants and mini-networks. However, numerous states quickly pulled out from the management of these programmes, due to a lack of resources. To remedy this, a consensus had been reached at the Bamako meetings of 1979 to transfer the management of the water programmes to the local level, thereby supporting the decentralisation reforms then adopted by numerous African states. However, due to the lack of means, local political representation and real decentralisation, the management of the water supply often reverted to traditional governance structures. - Delegation of management by national or local government to private operators, usually local ones. - Participatory or community management. There cannot be a real, sustainable improvement in the water and sanitation situation without appropriate governance and a proper institutional framework. Efficient, democratic, equitable and sustainable means are required, in order to provide all of the parties concerned – not only the most well-off – with real access to water in terms of quantity and quality, all this under economically acceptable conditions, in particular for the most deprived, fragile or vulnerable populations. Moreover, these means must take more account of the role of women, who are the main players in this field and the increasingly crucial role of the communities or local organisations. However, there is no universal or miracle solution in this matter, since situations often vary significantly from one place to another. The best governance is that which is best suited to the local context and its likely development. This document and the following ones mainly focus on participatory or community-based governance modes, which are often the most appropriate in poor rural or peri-urban areas. The other modes are generally well known but are not always the most appropriate, at least initially, for such regions. 4) Why use this means, where and since when ? These means have been used since the 70s, while the set-up of users associations and the delegation of services to private operators are a little more recent. They are used in all villages and small towns or suburban districts, notably in sub-Saharan Africa. 5) What do these modes of governance involve ? The public authority takes charge of the management of the water supply and/or sanitation, either at the national level via national companies, or at the local level via regional or municipal companies. When the public authorities do not take charge of the management of the water supply, it is generally assumed, at least initially, by the community’s traditional authorities. The responsibility for the management of a village’s water resource and infrastructure – and in rare cases sanitation – is allocated to a single person. The allocation and organisation of the mode of management is the responsibility of the village chief. The village chief organises the management and settles any conflicts. This management concerns all water resources. Each one determines the norms for the use of their water resources. In the event of a conflict, they try to solve it themselves or submit it to the village chief if the dispute persists. The village chief, with the population’s approval, chooses to entrust the management of the well or borehole to someone else. In general, this person acts as a supervisor of the water resource and reports directly to the village chief. This person liaises between the various users in the event of a conflict, in order to solve it on site, before being brought before the village chief. He organises the water rotation and ensures it is complied with. He also organises collections and receives the contributions for work such as well cleaning and borehole repairs. He ensures that the surroundings of the water resource are kept clean, with the help of the village chief, the population and benevolent souls (villagers who have sufficient means). Well-off villagers may, for example, for the sake of improvement and for their own profit, decide to build more convenient and productive wells operated by motorised pumps. They then organise the sale of the water themselves, often for crop irrigation. In general, the people who build such wells or have them drilled are land owners. This type of management is very similar to that of wells drilled by public authorities. But, in this case, the money goes to an individual instead of the community. 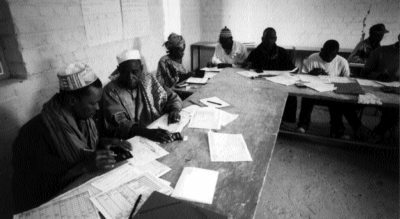 Training of a committee in Sudan. When traditional management is not satisfactory (see Section 6 - Main Advantages and Drawbacks) the communities may decide to set up a mode of management involving a larger segment of the population : either via management committees or, more recently, users associations. The management committees are composed of a certain number of community representatives (usually between 4 and 10 ) who jointly manage the water resource. Their effectiveness largely depends on the representativeness, capacity, qualification and commitment of their members. For the sake of transparency and effectiveness, they must not be solely composed of dignitaries and followers of the village chief but also involve deprived or vulnerable persons and, if possible, involve an equal number of women. The users associations are registered non-profit organisations. They are tasked with guaranteeing equitable access to water for the users, ensuring the sustainability of the facilities, managing the funds in a transparent way, ensuring that all the water consumed is paid for, representing all users, and using the proceeds of the sale of the water solely for operating purposes and the development of the systems. The capacities required of their members are similar to those previously stated. The user associations are governed by Articles of Association and rules applicable to all water users. These associations, which must produce regular reports, thus operate in line with democratic principles and are in a better position to ensure their sustainability. The authority in charge of managing the water supply – whether it is public, traditional or participatory – may decide to entrust the management to a private company. It is then important to ensure that a contract is drawn up to that effect. Moreover, when water supply facilities are neglected and no longer in use, an investor sometimes decides to rehabilitate them. The populations then acknowledge that it is legitimate for the investor to manage the facilities which it helped to restore, thereby resulting in de facto private management. Concerning public management : the public authority must take appropriate action and invest enough funds, after consultation with the local populations, something which requires a certain number of human, technical and financial means. If the means are insufficient, it may be preferable to opt for participatory or private management, but making sure that the state or community becomes the owner of the facilities and can exercise a right of control, in particular over the setting of prices. Concerning traditional management : a problem may arise due to abuse by the authorities ; the management may rapidly be done for the benefit of the traditional authorities, to the detriment of the greatest part of the population or of the poorest. If the traditional authority is questionable, is seems preferable to envisage private or participatory management. 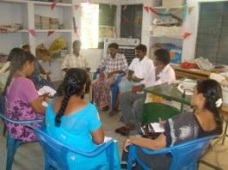 Concerning participatory management : the management committees may be faced with governance problems, as the management may be done for the benefit of committee members, usually community dignitaries. Moreover, the members do not always have the required management skills. This problem may also arise concerning the leaders of users associations. It may be solved through simple but appropriate training. Moreover, users associations must establish rules, something which may present some difficulty. It can be overcome, either by drawing on existing rules (see the appended example), or by adapting participatory methods, such as the PHAST method. Such methods make it possible to define the problems to be dealt with and solve them in a consensual way. Concerning private management : it is necessary to draw up very precise contracts of a sufficient but limited duration, setting out the terms and conditions of the management delegation, the expected results, the obligations, the duration of the contract, as well as the contract termination conditions. Advantages : guaranteed sustainability and protection of the resources and users. The easiest way of harmonising different systems and contributing to the defining and set-up of a national, regional or local water policy. Easiest way of harmonising rates between regions or consumers, or setting special rates for the poorest populations (e.g. possibility of using the revenues from a service or fully paid-up water supply facility to finance others or deciding to charge a little more for the water supplied to wealthy residents in order to subsidise that of the poorest). Drawbacks : requires public means, which are often in short supply in the countries concerned, as well as a strong commitment on the part of the authorities. In addition, the public authorities suffer from a lack of legitimacy to take over the management of facilities often built through financing from inhabitants or other players (NGOs in particular). Advantage : simplicity. Respects the established order. Drawbacks : numerous abuses possible, non-democratic operation, professionalism sometimes dubious. Advantages : greater legitimacy with the population, especially as concerns users associations. Drawbacks : possible abuse, in particular within management committees. Requires the defining of rules to prevent abuse. Certain members may not have the required skills for the management of the facilities, notably concerning accounting and strategic decision making (in particular for the planning of future investments). Advantages : makes it easier to find funds and skills and simplifies things for the communities. Permanent search for organisational efficiency. Training. Deficits are very rare. Drawbacks : risks of abuse if the management delegation contracts are not precise enough and if their implementation is not carefully monitored. Difficulty or lack of interest in making major long-term investments in view of the duration of the contracts or the populations’ actual payment capacities. The cost is impossible to estimate as it firstly depends on the nature and scale of the service, the number of inhabitants, the quality of the water to be treated, the type of facilities required and the management mode opted for. Nevertheless, it is generally agreed that the least expensive management mode is participatory management, closely followed by public management, then traditional management and lastly private management. But, on average, the gap between public management and private management is not as wide as people generally imagine : for example, a survey conducted by the Boston Consulting Group in 2006 revealed that, in France this gap only amounted to 7% on the bills, but was much lower, even negative, when state taxes were included. Given the public authorities’ insufficient means and the abuse stemming from traditional management modes, it may be advisable, if there is no existing local public service, to entrust the management of small networks or services to management committees or users associations, and set them a mode of governance which is as transparent and equitable as possible. If a problem arises concerning skills, the people obviously need to be trained. If this proves insufficient, it would be wise to envisage entrusting the management to a private operator, via the drafting of a contract comprising clear specifications stating the population’s expectations in terms of quality of service and cost. See documents C 7 and C 8 presenting 5 examples of successful achievements in this sector. - ISF (Ingénieurs sans frontières), AFVP (Association française des volontaires du progrès) and PSEau (Programme SolidaritéEau) ; "La gestion communautaire des centres d’adduction secondaire de la vallée de Matam", 84-page book relating the interesting results of a pilot project in Senegal, of which the most interesting passages are on pages 11 to 14, 39 to 45 and Annexes A4 to A6.